To join as an enlisted member or an officer typically depends upon what job you want to do in the Air Force. If you want to become a pilot, you must be an officer, so you will need to have graduated from college. However, many people with college degree join the military each year to become enlisted members of the special operations groups. There is a 10:1 ratio to enlisted personnel to officers in the special operations communities in nearly all branches of service. The Special Tactical Officers and Combat Rescue Officers are few in number compared to the Pararescue and Combat Control Technicians in the Air Force. So in the end, it really depends on how you want to start and continue your service in the military. However, the Air Force has several programs enlisted members can use to become commissioned officers. Unmarried enlisted members can apply to attend the Air Force Academy in Colorado Springs, CO. 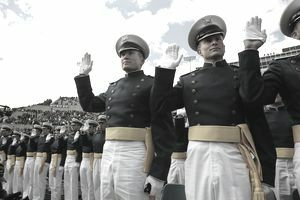 However, the selection process to any of the service academies is very rigid, and only the very best are accepted (this applies to civilian applicants, as well as enlisted applicants). There are slots for enlisted members to become members of the future class. They may have to attend a preparatory school prior to joining the Service Academy if they have been out of school for several years and need a refresher course on the typical course load of a college student. All of the Air Force enlisted commissioning programs are very competitive. In fact, it's probably harder to get a commission in the Air Force than any other service branch. Except for rated commissions (pilot, navigator, air battle manager), the Air Force likes their officers to have technical or "hard science" degrees, such as aerospace engineering, physics, computer science, or chemistry. The Air Force also likes their officers to have a very high college GPA (3.2 or above is considered competitive). For pilots, while a technical degree is not required, one still needs a very high GPA, and a high score on the Pilot/Navigator sections of the Air Force Officer Qualifying Test (AFOQT) to be selected. Enlisted members who possess or earn a bachelor's degree can apply for selection to the Air Force Officer Training School (OTS), after one year of active duty service. The OTS motto "Always with Honor" is reflected in the school’s honor code: "We will not lie, steal, or cheat, nor tolerate among us anyone who does." This is the same code as the United States Military Academy at West Point. As the Air Force has evolved since World War II from the Army Air Corps, many of the Army's customs have been the foundation of the Air Force today. Other Air Force enlisted commissioning programs include becoming a full-time student in a college with an active Air Force ROTC detachment. You can pursue a bachelor's or higher degree and will Academy. as a second lieutenant upon graduation and completion of the two-year program. You will then be returned to active duty (typically within 60 days of commissioning). Since the military paid in full your college bill, as well as paid you your monthly salary, you owe the Air Force four years of service as an officer. To be qualified for the programs below, you need to be competitive with a high college grade-point average, Air Force Officer Qualification Test (AFOQT) score, commander recommendations, EPRs (Enlisted Performance Reports), military decorations, and other aspects of the member's military records. Anything to help you stand out as an above average performer can offer you the opportunity to serve as an officer in the Air Force.